A former member of the terrorist PYD who surrendered to Turkish security forces told interrogators that if the July 15 defeated coup had been successful, the PYD was planning to follow PKK attacks in Turkey with its own operations. 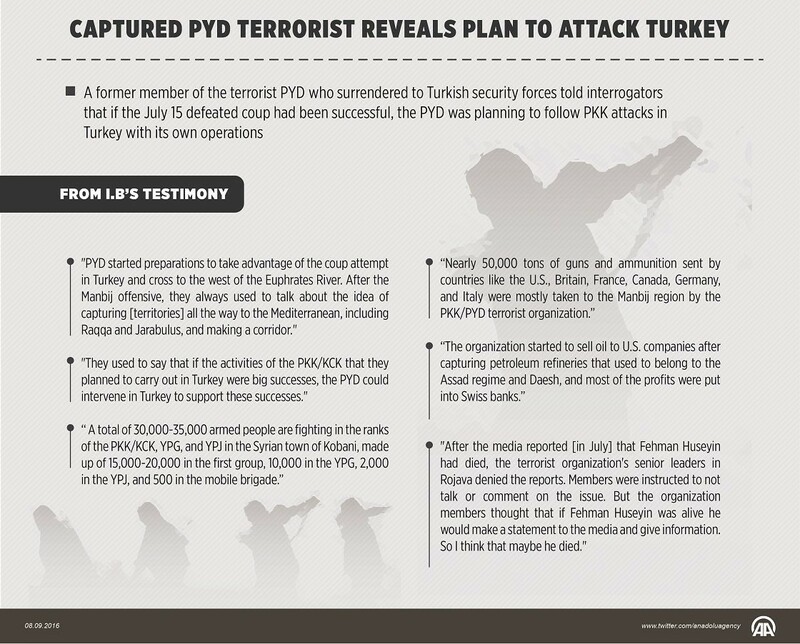 The PYD is the Syrian branch of the terrorist organization PKK. In his testimony, seen by Anadolu Agency, the 21-year-old fighter identified as I.B. 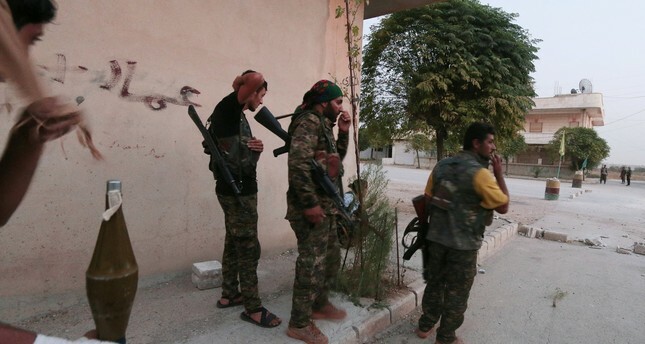 said that he had fled the Rasulayn region of Syria's Hasakah province and became a platoon commander in a PYD/YPG-controlled battalion in the Ceylanpinar district of Sanliurfa, southeastern Turkey before surrendering to the gendarmerie. I.B. told about the defeated coup in Turkey and international links to it, referring to the offensive to retake from Daesh the city of Manbij, west of the Euphrates River, which started in late May and concluded in August. "The organization [PYD] started preparations to take advantage of the coup attempt in Turkey and cross to the west of the Euphrates River. After the Manbij offensive, they always used to talk about the idea of capturing [territories] all the way to the Mediterranean, including Raqqa and Jarabulus, and making a corridor. "They used to say that if the activities of the PKK/KCK that they planned to carry out in Turkey were big successes, the PYD could intervene in Turkey to support these successes," he said. He also said that a total of 30,000-35,000 were fighting in the ranks of the PKK/KCK, YPG, and YPJ in the Syrian town of Kobani, made up of 15,000-20,000 in the first group, 10,000 in the YPG, 2,000 in the YPJ, and 500 in the mobile brigade. Nearly 50,000 tons of guns and ammunition sent by countries like the U.S., Britain, France, Canada, Germany, and Italy were mostly taken to the Manbij region by the PKK/PYD terrorist organization, I.B. said. He underlined that the organization started to sell oil to U.S. companies after capturing petroleum refineries that used to belong to the Assad regime and Daesh, and that most of the profits were put into Swiss banks. I.B. also talked about whether senior PKK commander Fehman Huseyin, also known as Bahoz Erdal, had died in Syria or not. "After the media reported [in July] that Fehman Huseyin had died, the terrorist organization's senior leaders in Rojava denied the reports. Members were instructed to not talk or comment on the issue. But the organization members thought that if Fehman Huseyin was alive he would make a statement to the media and give information. So I think that maybe he died," I.B. added.